2. Complete quests. Many of them will reward you with some gems. 3. 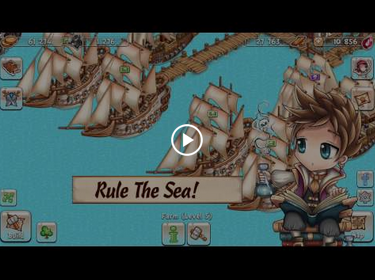 Collect wreckages, kill Jelly pigs, Sea Dragons and Ghost ships. The higher the level of a monster or wreckage the bigger amount of gems could be dropped from them. But be carefull! All the monsters are tricky! Read their skills and remember: you need to have a certain fleet to kill each type and level of those monsters. Jelly pig's skill is to kill one of your ships at the start of the battle. This means the more powerful ships you send against a Jelly pig, the more expensive will be the repair cost. Jelly pigs don't drop much resources, so if send Caravellas or more powerful ships, you will defenetely spend more resources on repair than you get in case of victory. The best choice against Jelly pigs are Howkers (5-9). But from a certain level Jelly pigs start to drop more resources, than Howkeres can load. In this case a couple of Koggs could be helpful. But! Koggs are very slow, and the fleet containing a Kogg can be easely intercepted by other players. Be carefull! Sea Dragon's are extremely powerful, their power grows up depending on level very fast. This means if your fleet has defeated a Dragon level 10, taking some damage, a Dragon level 12 probably will destroy your fleet like a bug. Also, Sea Dragon's ability to consume the weakest ship can be very painful if your fleet consts of Frigates or more expensive ships. If you're not sure you'll win, better add a Shallop to your fleet. If you lost, you'll lost the shallop, which is very cheap. Don't even try to kill even level 1 Ghost ship until you're level 30! If you lose against a Ghost ship, you lose all your weapons, that can be very-very expensive. Do not attack Ghost ship until you're sure your fleet will kill it taking no damage. There are two ways to perform a joint attack. Both fleets are on a foreign sector. Send a slower fleet first to attack, then select a faster one and click on the slower fleet's ship icon. Select 'Join' in the menu. Please note, your ships become faster when leveling up. It means your high level howker can be faster than a caravel. The easiest way is to have a slow cargo ship in one fleet, like Kogg or Karakka, and the other fleet without cargo ships. Your fleet is attacking a monster or an enemy fleet, your ally is joining your fleet. Or: your ally is attacking a monster or an enemy fleet near your city, you join. For both cases there should be enough time for the second fleet to reach the meeting point. Otherwise, you'll get 'Target is unreachable' message.